That is all we coffeeneurs know on earth… at least while the Coffeeneuring Challenge goes on. A new blog roundup is in order! David L. of Seattle, created a Coffeeneurs group on Facebook, and had this report of his coffeeneuring so far. Another guest post in the mix! Clodhopper Rides talks about life as a coffeeneur in Sioux Center, Iowa. The Hudson Valley Randonneur rides the Hudson Valley Rail Trail to coffee and a donut. Caution: Beautiful fall photos after the jump! Another blogging coffeeneur has joined the challenge, and just in the nick of time, too! Welcome, Fiets of STyLe! Fingers crossed that we can add Missouri to the Magic Coffeeneuring Map this year. A roundup within a roundup. Meta! Coffeeneuring 4-7 from Rambling Rider. My favorite bike rider, The Daily Randonneur, goes to see Gravity but only after he’s had a double espresso at Tryst. DCyclist goes to Qualia. Looks tasty. Town Mouse rides back from a climate change demonstration and is then treated to a hailstorm en route to her coffeeneuring destination. Baltimore coffeeneur Ryan Dupre has a little bit of everything in this stop: biking, food, an I.P.A., and a fine-looking double espresso. A tour of Anchorage featuring a new trail opening. Banking Time banks trip number 7. Coffeeneuring on a green Quickbeam! See Bike Tinker’s post. Musically Middlebrow coffeeneurs to the best bagels in Seattle and a drip coffee. Pierogis, coffeeneuring, and making your bike less of a death trap. Shank Rides Bikes does it all on this day. Bicycles in Newcastle recommends you go to Ma Belle if you ever coffeeneur in her neck of the woods. All seven trips are in the bag. 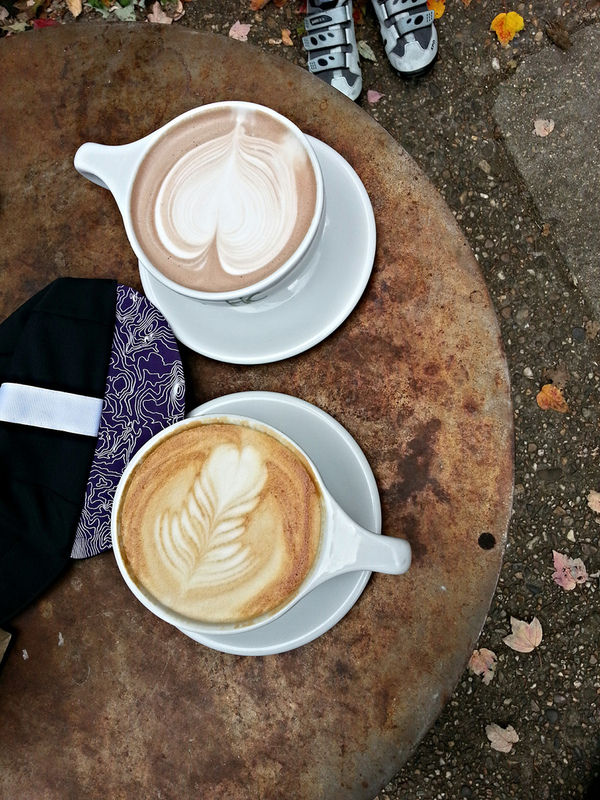 Rootchopper has a rundown of his 2013 coffeeneuring here. Robert Kerner coffeeneurs and does an errand so that he can then make these. Yummy! Sunrise Coffee Club to a Coffee Shop Without Walls and a French Press. It’s Urban Adventure League in Portland! Another Ride 7 report. This one’s from Cruisin’ Downhill, whose final pastryneuring coffeeneuring ride includes an immature bald eagle sighting! New blog discovery! All Kinds of Bikes is coffeeneuring. I don’t know where they are located, but they’re about halfway through the challenge and provide some good reporting on the bike rack/parking situation as well as the beverage quality at each locale. 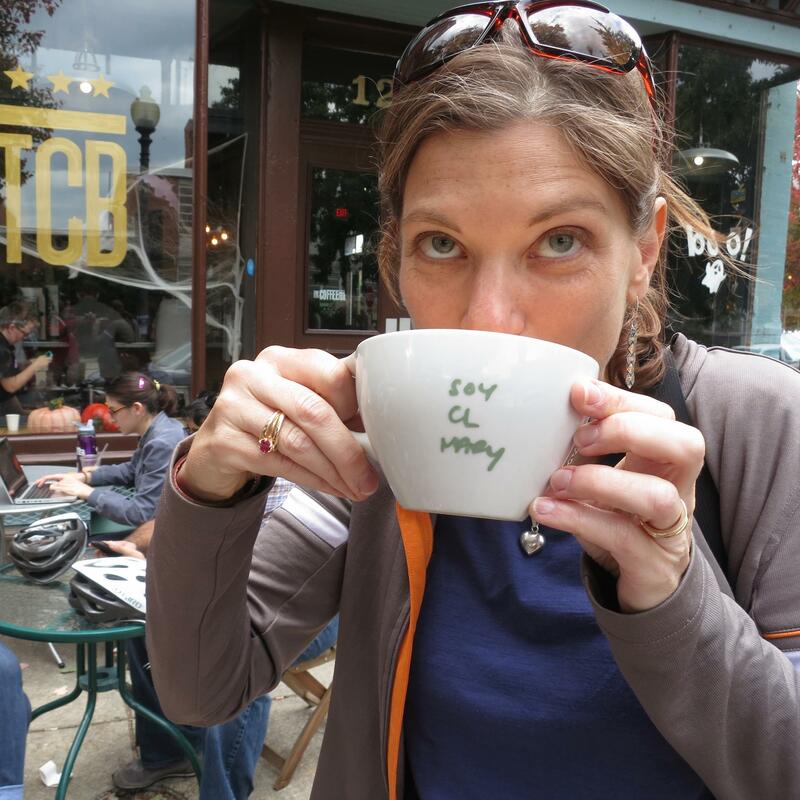 “In between” her 200K ride, Lynne went coffeeneuring. I like it. It’s Lynne again! This time in Melange‘s early morning coffeeneuring report. Tex’s Luaxvull Cycling makes it to Coffeeneuring Controles 2 and 3, and a French toast biscotti. Another reason I must visit Pittsburgh: Type 2 Clydesdale Cyclist highlights the Over the Bar Bicycle Cafe at the Boathouse and it sounds great. Bikes Coffee Beer takes us to a Coffee Shop Without Walls in Austin. A Halloween-themed Coffee Shop Without Walls from Everyday Cycling. Hanna‘s still cross racing and coffeeneuring in Finland. Go Hanna! A Coffee Shop Without Walls and a little bit of snow. Maine coffeeneuring with Lanterne Rouge. A trailer turned coffeehouse? An Old Guy on Two Wheels has the full story of this new Austin locale. Another coffeeneuring roundup in the roundup from The Accidental Cyclist. Iron Rider‘s fourth coffeeneuring trip is a family affair through a sea of fall color. Gorgeous! The duck leaves Pittsburgh. 😦 As Seen from My Bike has that and more in her latest (and final!) coffeeneuring post. Del Ray to DC is back in Virginia after a trip that included meeting the man behind Ocean Air Cycles. His welcome back coffeeneuring included a pour over at the new Swing’s in Del Ray. Am I the only one who thinks that pour overs look like too much work? Is that a crime to say? UPDATE! Baltimore-area rider Bikes n Coffee (whose coffeeneuring I am following, but somehow have been remiss in posting) takes the drunken sailor route to Dunkin Donuts en route to buying some coffee beans from a local shop, aptly named Coffee Coffee. UPDATE! Despite not officially coffeeneuring this year, Texas blogger Pondero has been getting in what he calls “coffeeneuring practice,” a la Coffee Shop Without Walls. Good photos await you, AND another Quickbeam! UPDATE! Of Bikes and Beans in PDX goes for a cup from the Steampunk Machine. Am I the last to hear of this device? UPDATE! 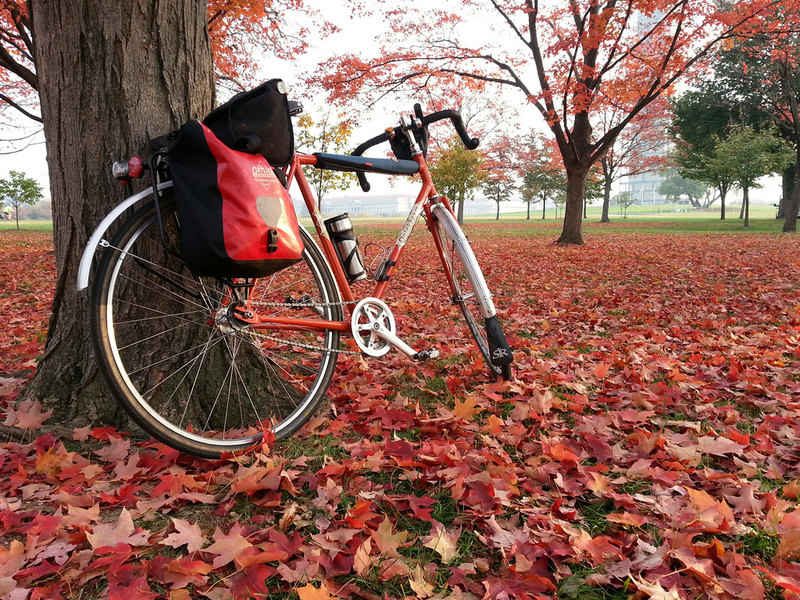 A chilly coffeeneuring recovery ride and a few nice fall foliage shots from Amrook in Washington… the state, that is. If I missed you, please let me know and I will add you to the update! Coffeeneuring Rewind with David H. in Chevy Chase, Md. Sent from my iPhone which sometimes has a mind of its own. You didn’t miss me, i’m just a little slow to post. But now that I have, I’m going to reward myself by reading everyone else’s coffeeneuring adventures. I only got introduced after visiting the Del Ray Swings earlier this year, but I’ve just assembled my own kit to do the same thing and I’m enjoying the slow brewed deliciousness almost every day! We’ll have to do a coffeeneuring w/out walls for you to give it a go!